If you’ve got particular possessions at home that you’d rather not take a risk with, then investing in a home safe can be the easiest and safest option to keep your belongings secure. This can save you the time and money of renting an external safety deposit box somewhere, and you can get strong and sturdy home safes for very reasonable prices. The type of safe you choose to buy will depend on what you’re planning to store in it and just how durable you need it to be. Most basic safes will of course deter burglars from trying their luck, but if you really don’t want to risk it being broken into, then a more expensive safe will be harder for someone to crack. Safes aren’t just used for protection against burglars, but top of the range safes can also protect your belongings in the event of a fire or other damage to your home. When picking the right safe for you, make sure you pick the locking mechanism that is easiest for you to use. A dial or keypad will require you to remember a combination, but a lock and key will mean you need to then keep the key in another safe place, and will most likely want to create replicas in case you lose it. From family heirlooms to passports and cash, a home safe can be a great investment to give you peace of mind that your valuables are all kept secure in one place. Check out our list of the best home safes to find out what’s best for you! This home safe is designed to be put through the wars, as it’s able to withstand heat up to 927 degrees and is also water resistant to stop the contents from flooding. It’s incredibly durable with three large locking bolts which make it tricky to break, and it features an electronic lock with digital combination in order to open the safe. The inside of the safe is spacious with adjustable shelves, and you’ll also have an interior light so it is easy to store your belongings clearly. It’s incredibly heavy, which only makes it more secure and it has a pull-resistant hinge should anyone try to break into it. This simple yet durable safe is recommended for storing a variety of items from cash to jewellery and important documents. It is big enough to lay A4 documents flat, and this home safe is also cash rated which means it is recommended to safely store up to £2000 cash or up to £20,000 worth of valuables. It’s fire resistant up to 1 hour and the electronic combination lock is said to be easy to set. Some users have noted that the base is a little wobbly, although it has special feet which stop it from doing this. If you’re looking for a simple safe to store your valuables in, then this one is compact and ideal for storing in a concealed area such as a wardrobe or cupboard. The safe comes with screws that allow you to fix it to the floor or a wall for extra security, and you’ll also have the peace of mind you can always retrieve a backup key using the safe serial number should you not be able to access it via the keypad. It’s not the biggest safe and it won’t hold up against fire, but it is a great little safe for basic valuables to be hidden away. 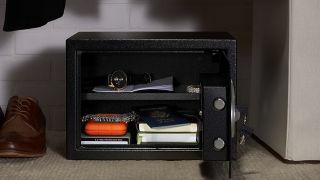 This safe is excellent value for money that will provide you a safe and secure place for valuables and cash. It is not resistant against fire or water but it is made of sturdy steel which is enough to deter intruders from attempting to break this safe. It can be placed in a wardrobe or cupboard so that it is discreet, and has a carpeted bottom to avoid making scratches. It has an easy-to-use keypad entry system and comes with two emergency override keys should you have trouble accessing it. If you are just looking for something small and discreet to stash your valuables in, then this lock box disguised as a book could be just the thing to keep on your bookshelf. It is small and compact, so it won’t fit much in but is perfect for cash or other small items such as jewellery, and due to its size it makes it easy to transport with you. This lock box is secured with a key and for the price users find it to be a great way to discreetly keep valuables safe in their home.